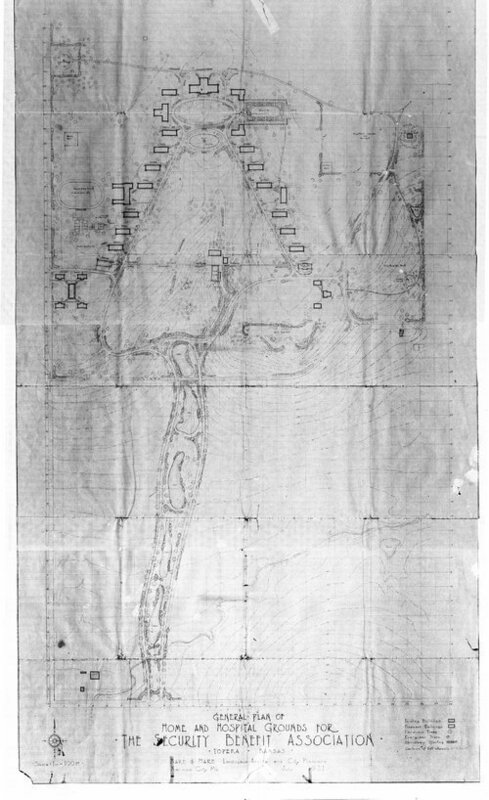 This plat shows the general plans for the Security Benefit Association's home and hospital grounds in Topeka, Kansas. The facility was located west of Sixth Avenue in Topeka, Kansas and was owned and operated by the fraternal organization. The 400-acre grounds consisted of a hospital, retirement home, children's home, school and greenhouse. In the 1950s the cooperative farm was abandoned when the company ceased to be a fraternal organization and became primarily a life insurance company know as Security Benefit Life. The land was eventually sold to the Menninger Foundation. Today, only a few structures are remaining.